Medullary thyroid carcinoma (MTC) constitutes around 5% of all thyroid cancers. It accounts for as much as 13% of all thyroid cancer-related deaths. , MTC usually arises from parafollicular C-cells that normally secrete a number of peptide hormones such as calcitonin, serotonin, and vasoactive intestinal peptide; thus, it is widely accepted as a neuroendocrine tumor. Both sporadic and familial forms are seen, the sporadic form being responsible for 70% of the cases and familial form for 10-20% of the cases. The prognosis of MTC is worse as compared to differentiated thyroid cancers, with a 10-year survival rate of 95.6% in cases restricted to the thyroid gland, but only 40% for those presenting with metastasis. Here, we present the case reports of two patients with sporadic MTC. 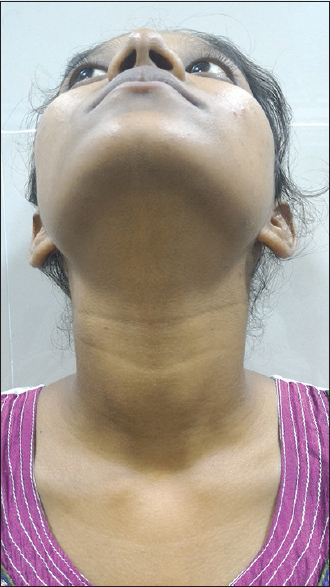 A 19-year-old female presented with progressively increasing midline swelling for 2 months. Neck examination revealed 3 cm × 2 cm × 2 cm swelling on the right side of the neck, extending from midline to the anterior border of sternocleidomastoid, which was 2 cm below the hyoid and up to 3 cm from the suprasternal notch. On palpation, it was firm and mobile. She also had enlarged lymph nodes in the right level II and level III, each measuring 1 cm × 1 cm [Figure 1]. She had raised levels of thyroid-stimulating hormone being 9.92 μIU/ml with normal levels of free T3 (2.38 pg/ml) and free T4 (1.18 ng/ml). Serum calcitonin was raised 100 times above the normal level being 1404 pg/ml. Ultrasonography of the neck showed the presence of two hypoechoic lesions in the right lobe of thyroid with the specifications of macrocalcifications as well as both central and peripheral vascularity. Fine-needle aspiration cytology (FNAC) of the right lobe of thyroid was suggestive of medullary carcinoma of thyroid. Moreover, FNAC from cervical nodes revealed metastasis of medullary carcinoma of thyroid. 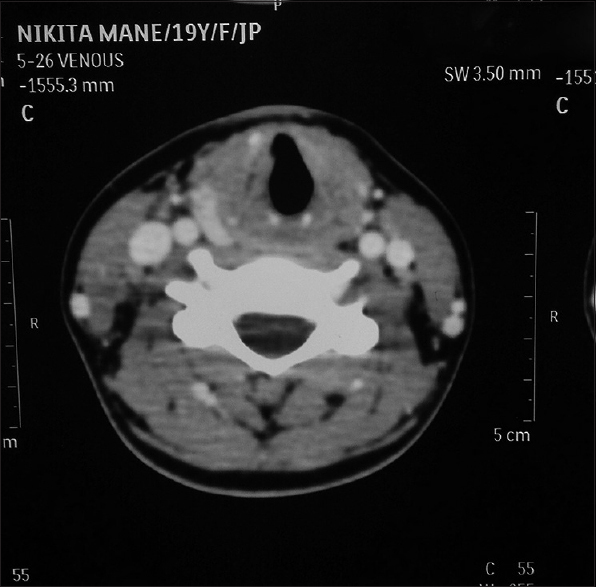 Computed tomography (CT) neck was also suggestive of two nodules in the right lobe of thyroid and metastatic lymphadenopathy [Figure 2]. The second patient was a 49-year-old female with swelling in the midline of the neck for 1 year with no other associated complaints. 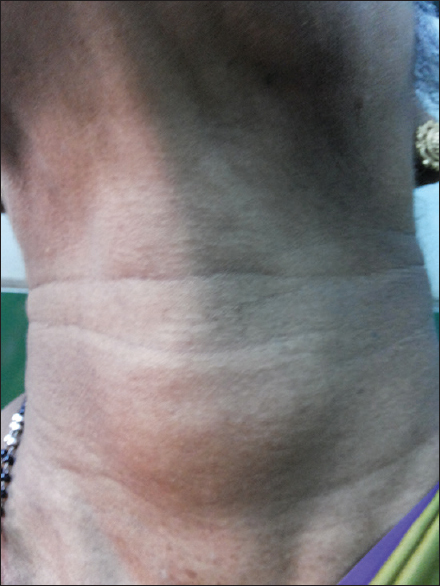 Clinical examination showed a midline firm neck swelling about 3 cm × 2 cm × 2 cm moving with deglutition. Cervical lymph nodes were not palpable [Figure 3]. Ultrasonography of the neck revealed a dominant hypoechoic nodule in the mid part of the left lobe of thyroid with subcentimetric hypoechoic lesions in rest of the left lobe and right lobe of thyroid. FNAC was performed which was suggestive of the features of medullary carcinoma of thyroid. Serum calcitonin was 215 pg/ml, and thyroid function tests were within normal limits. 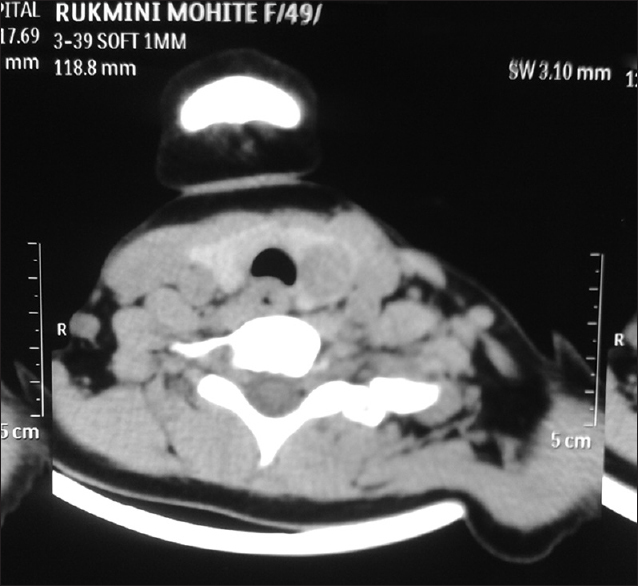 Contrast-enhanced CT (CECT) neck also revealed heterogeneous enhancement in the left lobe of thyroid [Figure 4]. There was no past history of thyroiditis, radiation exposure, or a family history of MTC. Both the patients underwent laboratory evaluation of serum calcium and 24 h urinary metanephrines which came out to be normal. 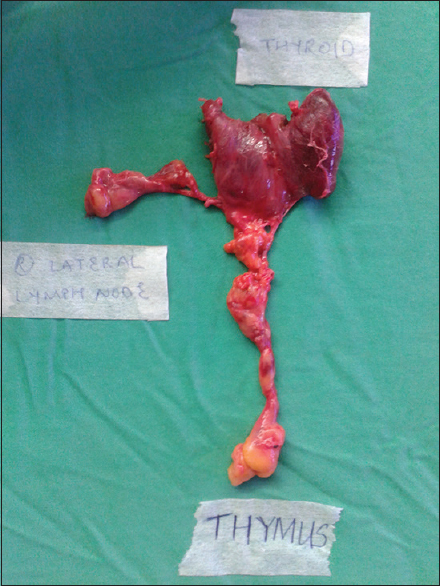 The first patient underwent total thyroidectomy with central compartment neck dissection and the right lateral neck dissection [Figure 5], and also in the second patient, total thyroidectomy with central compartment neck dissection was performed [Figure 6]. Final histopathology showed nests and sheets of cells with moderate-to-abundant cytoplasm, eccentrically placed nuclei surrounded by dense pink homogeneous material (amyloid), and the tumor was limited to thyroid capsule. Postoperative serum calcitonin at 6 months following the surgery came out to be 2 pg/ml in the first patient and 1 pg/ml in the second case. Both the patients are on regular follow-up, and there has been no recurrence. The most common presentation of sporadic MTC is a painless solitary thyroid nodule, and multifocality and bilaterality are the features of the hereditary forms. Cervical lymph node metastasis is approximately found in 50% of the cases at the time of diagnosis, whereas distant metastases are present in 10% of the cases;  higher incidence being those with large tumor size or multifocal tumors. In our study also, both the females presented with multiple hypoechoic nodules, but cervical metastasis was found only in the first patient. Being a neuroendocrine tumor, in some of the cases, excess calcitonin secretion may cause symptoms such as flushing and diarrhea. In addition, some of the patients may even present with systemic manifestations due to the secretion of several peptides and substances, including vasoactive intestinal peptide, chromogranin A, bombesin, neurotensin, carcinoembryonic antigen (CEA), somatostatin, and adrenocorticotropic hormone. However, both of our patients did not have any of these symptoms. Serum calcitonin levels serve as a specific tumor marker with a high sensitivity rate for MTC diagnosis. , It is also helpful in detecting recurrence after surgery. Although a lot of physiologic and pathologic conditions such as physical activity, hypergastrinemia, hypercalcemia, renal insufficiency, and proton pump inhibitory drugs may even be related to hypercalcitoninemia, it is seen that only up to 40% of all cases with raised serum calcitonin levels in the presence of a thyroid nodule actually have MTC. Thus, according to the American Thyroid Association, it is not routinely recommended and hence preoperative normal calcitonin value always cannot exclude the diagnosis of MTC. Another biomarker, CEA, is also produced by the neoplastic C-cells, and it has been useful in predicting the prognosis of MTC patients, more importantly when preoperative serum calcitonin values are negative. CEA may be found in >50% of the MTC patients, and levels above 30 ng/ml strongly indicate a poor prognosis. It is also seen that CEA values more than 100 ng/mL are found to be associated with extensive lymph node involvement and distant metastasis. Here, both of our patients had significantly raised levels of serum calcitonin which regressed to baseline following the surgery, but CEA was not done. Neck ultrasound should be performed as the traditional approach to thyroid nodules. Although MTC has no classical feature on ultrasound, it can be helpful to show the nodule characteristics, enlarged lymph nodes, if any, and to guide FNAC from the suspicious nodules. FNAC is usually the first line of investigation for diagnosing thyroid nodules. In both of our cases, classical features of MTC in FNAC were seen which included plasmacytoid appearance of cells and multiple spindle-shaped cells with the presence of amyloid. In both the cases, MTC was of sporadic type on account of the absence of family history. Pheochromocytoma was ruled out on the basis of normal abdominal CT scan, normal plasma catecholamine levels, and excretion of metanephrine and nor-metanephrine in a urine sample collected after 24 h.
It is recommended that we should look for RET germline mutations in all cases that presented with MTC and/or pheochromocytoma and in at-risk family members from MEN 2 genealogies. In our first case, the patient underwent genetic testing for detecting mutations in RET proto-oncogene, but it came out to be negative. This was important as the patient was a young 19-year-old female with extensive disease, and the absence of mutation ruled out the possibility of other associated tumors and hence, further in future, we need not follow up her for other neuroendocrine tumors. Since the second patient was a middle-aged female with no cervical metastasis, we did not go ahead with genetic testing in her. Total thyroidectomy along with central compartment neck dissection is the treatment of choice for the patients with medullary carcinoma of thyroid. The incidence of central neck metastasis can be as high as 81% in patients with palpable tumors  and thus, central compartment neck dissection provides a better survival and cure rate than total thyroidectomy alone. The role of routine lateral neck dissection in treating patients with MTC is less clear. Ipsilateral lateral nodal metastases may be present in 14-80% of the patients, , and contralateral lateral nodal metastases have been described in 19-49% of the patients. , Since there is a huge risk of neck metastasis, even in tumors <1 cm, few surgeons do recommend bilateral lateral neck dissection in all patients with MTC. , As we all know that bilateral neck dissection is associated with a lot of complications, many surgeons advise a conservative approach to the lateral neck, especially in case when the primary tumor is <1 cm. And hence, ipsilateral neck dissection becomes necessary when enlarged/suspicious lymphadenopathy is detected by ultrasonography or physical examination, central compartment lymph nodes are involved, or the primary tumor size is larger than 1 cm. All those patients who present with disease limited to the thyroid gland without neck node involvement tend to have a low recurrence rate and rarely die from their disease. However, since a lot of patients with MTC have nodal disease at the time of presentation, they are at a greater risk for developing recurrent or persistent disease. Thus, they have to be on a strict postoperative follow-up and monitoring. The postoperative follow-up should begin 2-3 months after operation and it is based on serum calcitonin and CEA levels. Patients with undetectable calcitonin levels postoperatively are usually followed with yearly measurements of serum calcitonin and CEA. In addition, ultrasound of the neck can also be done, but appears to have no added advantage. In case of patients with elevated levels of serum markers, ultrasound of the neck or CT/magnetic resonance imaging can be done. Although thyroid hormone replacement is required after a total thyroidectomy, thyroid-stimulating hormone suppression is not needed in patients with MTC. Annual screening becomes necessary for all patients with hereditary disease to look for the development of pheochromocytoma and hyperparathyroidism. The prognosis for patients with MTC seems good with a 10-year survival rate for patients with MTC being 75-85%. ,, About 50% of the patients with MTC have disease restricted to the thyroid gland, and have a 10-year survival rate of 95.6%. Approximately, one-third of the patients present with locally invasive tumors or with metastasis to the regional lymph nodes. The survival rate of patients with regional disease is 75.5%. Distant metastases may be seen in 13% of the patients at the initial diagnosis and have a poor prognosis, with a 10-year survival rate of only 40%. Prognosis is better in patients with MEN 2A as compared to sporadic MTC, as sporadic carcinoma is usually diagnosed late when the disease is pretty advanced. In addition, FMTC has a better survival rate and MEN 2B seems to have the worst prognosis (Bergholm et al., 1990, Grauer et al., 1990, Samaan et al., 1988, and Nguyen et al., 1992). Early diagnosis has a chance of offering higher cure rate. MTC being an uncommon and a rare thyroid malignancy, its management is different than that for differentiated thyroid cancers. Genetic screening and the evaluation of familial syndromes should always be considered in preoperative work-up in MTC patients. Early diagnosis offers a higher likelihood of cure and long-term survival. Total thyroidectomy plus central compartment neck dissection is the mainstay of treatment. All patients must be kept on regular follow-up to avoid recurrence. Links TP, Verbeek HH, Hofstra RM, Plukker JT. Endocrine tumours: Progressive metastatic medullary thyroid carcinoma: First- and second-line strategies. Eur J Endocrinol 2015;172:R241-51. Hung WW, Wang CS, Tsai KB, Ou-Yang F, Shin SJ, Hsiao PJ. Medullary thyroid carcinoma with poor differentiation and atypical radiographic pattern of metastasis. Pathol Int 2009;59:660-3. Hsieh MH, Hsiao YL, Chang TC. Fine needle aspiration cytology stained with Rius method in quicker diagnosis of medullary thyroid carcinoma. J Formos Med Assoc 2007;106:728-35. Sippel RS, Kunnimalaiyaan M, Chen H. Current management of medullary thyroid cancer. Oncologist 2008;13:539-47. Hazard JB. The C cells (parafollicular cells) of the thyroid gland and medullary thyroid carcinoma. A review. Am J Pathol 1977;88:213-50. Fialkowski EA, Moley JF. Current approaches to medullary thyroid carcinoma, sporadic and familial. J Surg Oncol 2006;94:737-47. Moo-Young TA, Traugott AL, Moley JF. Sporadic and familial medullary thyroid carcinoma: State of the art. Surg Clin North Am 2009;89:1193-204. Liu Z, Falola J, Zhu X, Gu Y, Kim LT, Sarosi GA, et al. Antiproliferative effects of Src inhibition on medullary thyroid cancer. J Clin Endocrinol Metab 2004;89:3503-9. Cakir M, Grossman AB. Medullary thyroid cancer: Molecular biology and novel molecular therapies. Neuroendocrinology 2009;90:323-48.
de Groot JW, Plukker JT, Wolffenbuttel BH, Wiggers T, Sluiter WJ, Links TP. Determinants of life expectancy in medullary thyroid cancer: Age does not matter. Clin Endocrinol (Oxf) 2006;65:729-36. Machens A, Hauptmann S, Dralle H. Increased risk of lymph node metastasis in multifocal hereditary and sporadic medullary thyroid cancer. World J Surg 2007;31:1960-5. Strosberg JR. Update on the management of unusual neuroendocrine tumors: Pheochromocytoma and paraganglioma, medullary thyroid cancer and adrenocortical carcinoma. Semin Oncol 2013;40:120-33. Brandi ML, Gagel RF, Angeli A, Bilezikian JP, Beck-Peccoz P, Bordi C, et al. Guidelines for diagnosis and therapy of MEN type 1 and type 2. J Clin Endocrinol Metab 2001;86:5658-71. Maia AL, Siqueira DR, Kulcsar MA, Tincani AJ, Mazeto GM, Maciel LM. Diagnosis, treatment, and follow-up of medullary thyroid carcinoma: Recommendations by the Thyroid Department of the Brazilian Society of Endocrinology and Metabolism. Arq Bras Endocrinol Metabol 2014;58:667-700. Borget I, De Pouvourville G, Schlumberger M. Editorial: Calcitonin determination in patients with nodular thyroid disease. J Clin Endocrinol Metab 2007;92:425-7. Roy M, Chen H, Sippel RS. Current understanding and management of medullary thyroid cancer. Oncologist 2013;18:1093-100. Machens A, Schneyer U, Holzhausen HJ, Dralle H. Prospects of remission in medullary thyroid carcinoma according to basal calcitonin level. J Clin Endocrinol Metab 2005;90:2029-34. Machens A, Dralle H. Pretargeted anti-carcinoembryonic-antigen radioimmunotherapy for medullary thyroid carcinoma. J Clin Oncol 2006;24:e37. Santos MA, Nunes AB, Abelin N, Ezabella MC, Toledo Rde A, Lourenço DM Jr., et al. Genetic screening of multiple endocrine neoplasia type 2: Experience of the USP Endocrine Genetics Unit. Arq Bras Endocrinol Metabol 2006;50:7-16. Moley JF, DeBenedetti MK. Patterns of nodal metastases in palpable medullary thyroid carcinoma: Recommendations for extent of node dissection. Ann Surg 1999;229:880-7. Greenblatt DY, Elson D, Mack E, Chen H. Initial lymph node dissection increases cure rates in patients with medullary thyroid cancer. Asian J Surg 2007;30:108-12. Scollo C, Baudin E, Travagli JP, Caillou B, Bellon N, Leboulleux S, et al. Rationale for central and bilateral lymph node dissection in sporadic and hereditary medullary thyroid cancer. J Clin Endocrinol Metab 2003;88:2070-5. Machens A, Hofmann C, Hauptmann S, Dralle H. Locoregional recurrence and death from medullary thyroid carcinoma in a contemporaneous series: 5-year results. Eur J Endocrinol 2007;157:85-93. Grozinsky-Glasberg S, Benbassat CA, Tsvetov G, Feinmesser R, Peretz H, Shimon I, et al. Medullary thyroid cancer: A retrospective analysis of a cohort treated at a single tertiary care center between 1970 and 2005. Thyroid 2007;17:549-56. Roman S, Lin R, Sosa JA. Prognosis of medullary thyroid carcinoma: Demographic, clinical, and pathologic predictors of survival in 1252 cases. Cancer 2006;107:2134-42. Ogilvie JB, Kebebew E. Indication and timing of thyroid surgery for patients with hereditary medullary thyroid cancer syndromes. J Natl Compr Canc Netw 2006;4:139-47. Meijer JA, Bakker LE, Valk GD, de Herder WW, de Wilt JH, Netea-Maier RT, et al. Radioactive iodine in the treatment of medullary thyroid carcinoma: A controlled multicenter study. Eur J Endocrinol 2013;168:779-86. Almeida MQ, Hoff AO. Recent advances in the molecular pathogenesis and targeted therapies of medullary thyroid carcinoma. Curr Opin Oncol 2012;24:229-34. Hart CD, De Boer RH. Profile of cabozantinib and its potential in the treatment of advanced medullary thyroid cancer. Onco Targets Ther 2013;6:1-7.